The city of Jisr al-Shughour has been struck by missiles. Local activists claim Russian forces are responsible, despite the demilitarized zone around Idlib Province. Some reports say the long-range missiles were fired from a Russian warship in the Mediterranean. Russian warplanes bombed near Jisr al-Shughour last month, with Moscow claiming that “terrorists” were targeted. Children moan for their dead father after having their house bombarded in Saraqibd during yesterday violence wave. The death tool has reached 15 death. Deadly Assad regime shelling of Idlib Province in northwest Syria continued on Sunday, killing at least 12 more civilians. Local reports said seven were slain in Nairab, including a woman and child, and more than 16 wounded, three of them critically. 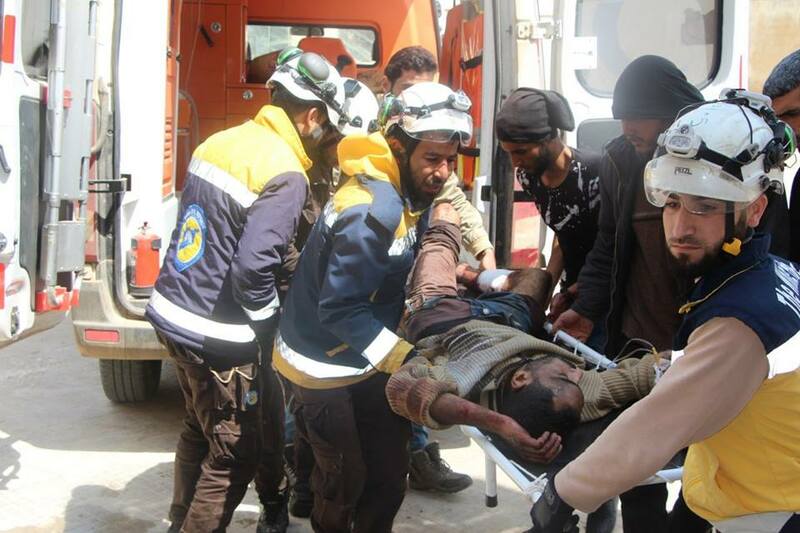 At least four people died in Saraqeb in eastern Idlib, among them the administrator of a youth sports program. At least one civilian was killed and others wounded from shelling on Khoain in the south of the province. The Assad regime escalated assaults in mid-February, killing scores of people — including 47 in a 10-day period — and breaking a demilitarized zone declared by Russia and Turkey last September. Since last Wednesday, at least 38 civilians have been slain in Idlib and northern Hama Provinces, home to more than 3 million people — about 20% of Syria’s remaining population after eight years of conflict. Many of them have been displaced by regime attacks in other parts of the country. The latest bombardment has included Russian-supplied BM-30 Smerch rockets, with a range of more than 50 km (31 miles); 300-mm rockets, and internationally-banned cluster munitions. The hardline Islamist bloc Hay’at Tahrir al-Sham has carried out retaliatory attacks in northern Hama. The group says it is targeting regime troops, but regime media said on Sunday that five people were killed by rockets fired on Masyaf. Despite announcing the 15 to 20-km wide demilitarized zone last September, Russia has joined regime attacks with airstrikes on Idlib. Moscow has declared that the attacks, including on civilian site, have been against “terrorists”. Turkey has held back Russia from endorsing a pro-Assad offensive to overrun Idlib, threatened before last autumn’s agreement. However, Ankara has not spoken about the regime shelling, despite one attack in Saturday near a Turkish military observation post in northern Hama. The Foreign Ministers of France, Germany, Britain, Canada, the US, Italy, and Japan expressed their “mounting concern” on Saturday after “the escalation in Syrian military activity in the de-escalation zone in Idlib over recent weeks”. I would not expect Assad to keep to any ceasefire, partly because he was not involved in making it and partly because it is not required under Islam. However, the involvement of Russia must have a motive and it is probably to flood Europe with more refugees and so helping to de-stabilise Europe. The way to stop this would be to involve the UN but as to date the UN has proven to be worthless in regard to Syria we cannot expect the UN to take positive action. So, look forward to more killing, maiming, destruction and refugees.